All-species fitness: Here's to Big Cats! Tigers are the largest member of the cat family (called Felidae --> feline!) and surely one of the world's most striking animals! 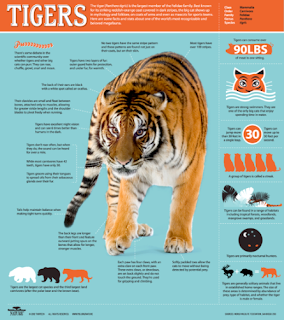 Learn more about tiger's size and stripes here. Tigers are gorgeous animals and revered by many cultures (and sports teams! ), but as human communities expand into the last few areas of forest, tall grass, and other natural vegetation used by tigers, they reduce, isolate, and eventually exterminate tiger populations. People kill tigers directly to use their skins for decoration and their body parts for "medicine", they starve them by hunting deer and other tiger prey, and they clear natural vegetation to plant crops and build towns. All of these activities combine to reduce the number of places tigers can still survive. Wild tiger numbers are at an all-time low. In just the last century, we've lost 97% of wild tigers - as few as 3,200 still exist in the wild today. They still roam in only about 7% of their former range, which stretched across much of Asia only 100 years ago. Apparently, if people can just stop hunting tigers and their natural prey and leave them sufficient reasonable habitat, they can maintain themselves. 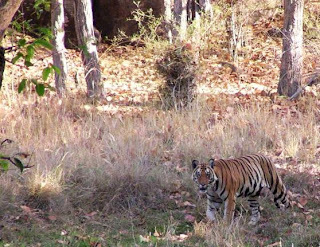 Nepal, where tigers are a key tourist attraction, presented some good news recently, in the form of a tiger survey showing a 63% increase in their country's population. 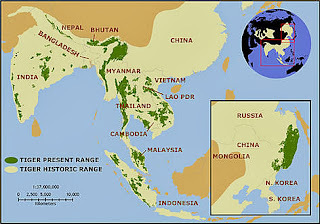 However, across much of tigers' native range (mainland southeast Asia, Indonesia, Malaysia), dense human populations and the skyrocketing use of palm oil for more products than you can imagine mean that tigers, as well as elephants, orangutans, and other wildlife are being crowded out into spaces that are too small for them to survive in healthy populations. If you can avoid using products made with palm oil (which is difficult, but doable), you can help to ease the demand on remaining forests not only in Asia, but Africa, South America, and Central America as well. It's pretty widespread, to say the least. On a more positive note, if you can visit places with Big Cats, such as India's national parks, you will support places and communities that depend on healthy populations of these great cats. In the meantime, for some great information on other Big Cats, here is a previous All-species fitness post highlighting National Geographic's Big Cat Week (check out their wonderful photos and videos!). India has taken a lot of initiatives in the last 3-4 years Which result in India becoming hot spot for wildlife tiger safari. We are seeing increase in our tiger safari India package inquiries. Ranthambore and Sariska are two of the main tiger seeing sites in northen Rajasthan. There are lots of things that needs to be done to save this species.